When you read such vividly described passages as these – pictures painted in words, to use a cliche – it is easy to imagine she could have also had a talent for art. Yet, until now, it has been her writing we remember her for – the five Booker nominations, Adolf Hitler in Liverpool, life backstage at the Playhouse Theatre – and maybe the time she damned Scouse accents as “hideous” on Radio 4. To Psiche Hughes, she was an outspoken, genuine eccentric (although she herself resented the description), but she was also a dear friend, a confidant and a caring mother. And, surprisingly, a dedicated and talented painter. Italian-born Hughes, who met Bainbridge in 1963 when she moved into the flat upstairs in a large Edwardian house in Hampstead, has spent the best part of two years writing a book about her art and pulling together an exhibition of her work that will open at the Museum of Liverpool next week. “After Beryl died I missed her very much. We were very close friends for a very long time,” she says. “I wanted to bring her back, in my mind anyway, and also I wanted to speak about our friendship but above all the fact that as well as being a very well known writer she was also a good painter. Few people knew that. It was in the garden of their home that the two women met. Both were single mothers escaping their failed marriages in a strange city – Bainbridge had just moved from Liverpool, Hughes from Cambridge – and both were passionate about art. With so much in common, they quickly became friends. “She was a person to whom I could say absolutely anything,” says Hughes. Bainbridge painted in the kitchen of her Hampstead flat, her children Jojo and Aaron, milling around as she worked. In contrast to her writing, which she often found hard going, this came easily to her. “She was a perfectionist in her writing,” says Hughes. But art, it seemed, flowed from her. As a girl growing up in Formby, Bainbridge often visited the Walker Art Gallery as well as a Southport gallery exhibiting work by Italian Quattrocento painter Fra Filippo Lippi, who became one of her favourite artists. Whilst working as an assistant at the Liverpool Playhouse in the early-1950s – an experience that would influence her 1989 book An Awfully Big Adventure, later made into a film starring Hugh Grant – she met her future husband Austin Davies, an artist and lecturer at the Liverpool College of Art who profoundly influenced her painting. But their marriage didn’t last and so Bainbridge ended up living in the flat above Hughes’s, well-positioned to meet the art world friends of the Italian schoolteacher’s partner (later husband) Philip Hughes. Drawn to her naive yet painterly style – the Hugheses own some six of her works including one of their children at the dinner table, painted to celebrate the birth of a new sibling – he arranged small exhibitions in his flat and invited friends who bought Bainbridge’s paintings for as little as £25. Her subjects were usually friends and family but in later years began to overlap with the topics in her novels – a piece depicting Hitler in full-Fuhrer garb walking down a flights of steps painted around the time she wrote Young Adolf, in which she imagined him visiting his brother in Liverpool; a series of works about the Titanic disaster reminiscent of her 1996 book Every Man For Himself, set aboard the doomed liner. Fifteen works will be exhibited in the Museum of Liverpool’s Skylight Gallery, in a show that will be opened by broadcaster Melvin Bragg. They mostly belong to the Hugheses, a number of friends and her three children (she had second daughter Rudi in 1965 to the writer Alan Sharp) to whom the author left them on her death in 2010. Bainbridge was 77 when she died of cancer, which had recurred. In conversations with Hughes, she had imagined her end to come in a bed surrounded by family, followed by a funeral featuring a coach and black horses. “In fact it wasn’t glamorous, death never is,” reveals Hughes. “Poor girl, she was so ill and unfortunately barely conscious towards the end because they loaded her with morphine. “But the funeral was more or less to her liking, not quite with black horses and feathers but a beautiful carriage and the service in Latin, mainly because she was crazy about it. She didn’t know Latin and she felt it was the epitome of culture and education. 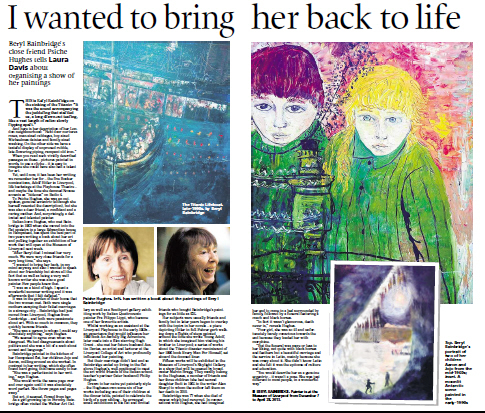 BERYL BAINBRIDGE, Painter is at the Museum of Liverpool from December 7 to April 28, 2013.